I found these photos showing the FACCo model A in company of MaBSTOA's first group of New Looks. What gives them away is the lack of paint on the lower panel and lack of rubber fenders around the tires. This has to be shortly before 5th Avenue was made one way south bound and the buses were prohibited from entering Washington Square. January 1964?? Photos borrowed solely for educational purpose. Good finds. 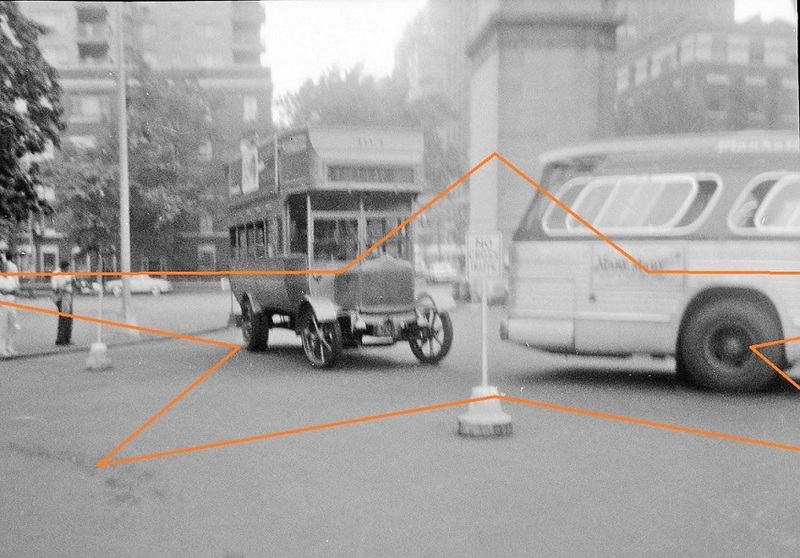 Washington Square Park was closed to traffic effective November 10, 1963. Because the trees are full and people are wearing short sleeve shirts, the photos must be the summer of 1962 or 1963. One-way traffic on Fifth Avenue began on January 14, 1966. It would have been around July of 1963. These were the TDH-5303's, of which a few (the last 71, 3485-3555) were assigned to 132nd Street initially (other depots to which those first buses ordered specifically for MaBSTOA were assigned were Coliseum in the Bronx, as well as Manhattan's Amsterdam, 100th Street and 146th Street garages). 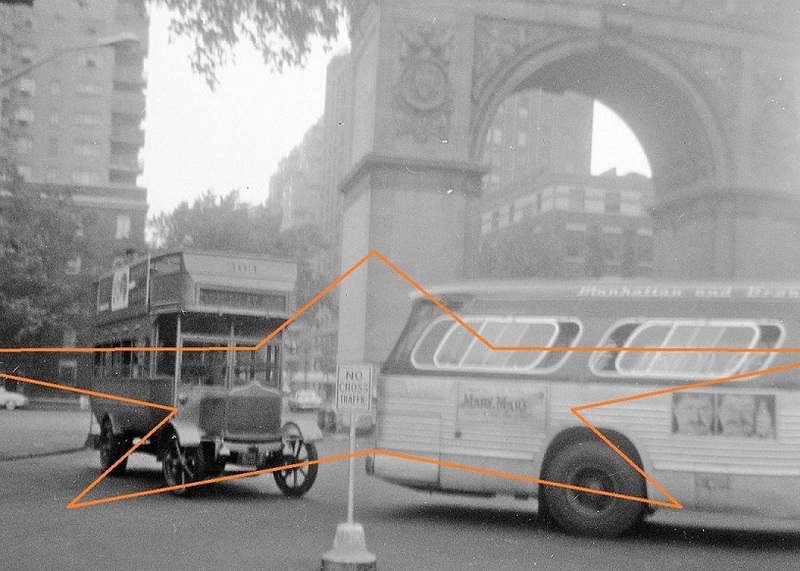 The effective date Washington Square was closed to bus traffic was actually Sept. 2, 1963. Nov. 10 was when the 5 - Fifth Avenue/Riverside Drive line's southern terminus was shifted to Houston Street and West Broadway. One key is the marker lights; the other the tail lights below the (then) 3-piece rear window setup. As well, an ad for Mary, Mary - the movie version of which came out in '63. I think NYCTA/MABSTOA started using the 4-piece rear windoiw combo with the third order of TDH-5303s, OA's 6401-6900. I think all of the older TA/OA 5303s were delivered with the 3-piece rear window arrangement, but in later years nearly all were replaced with the 4-piece setup. I recall in the late 70s a few of the 5201-5525 group still had the 3-piece setup. A few that come to mind are... 5270, 5328, 5354, 5382, 5391, 5451 and 5525. I'm sure there were others. Awesome. I saw this bus a few times. Originally, it was white with black stripe which were NYTPD colors at the time. While it looked like a TA/OA T6H-5310A... It was actually a T8H-5307A, but with just one door. Only MaBSTOA with the 6401-6900 set (contract MB-16-OA). NYCTA in that same time period instituted 4-piece rear windows with the second order of Flxible F2D6V-401-1's (TA 5601-5790, contract MB-16). If you've seen pics of the first set (within 5001-5165), any bus with 4-piece was converted from 3-piece (the center vertical line of a lighter grey than the rest of the frame holding the panels together). Of the MB-15-OA order (5201-5525) that retained the 3-piece, all but 5451 were for years stationed at 54th Street depot*, and one pic in the 54th Street brochure showed a 3-piece from the back view of the bus. 5451, as of December 1965, was at 146th Street, then in the 1970-74 period at 100th Street. As for 5525, as of February 1970 it was at 146th Street, then in 1973 and '74 at Hudson depot. It would be interesting to see which bus numbers in that order were converted to 4-piece, to see which of the depots made such conversion. MaBSTOA 3301-3555 were acquired in June 1963 (contract MB-14-OA), and were assigned to West Farms and Kingsbridge Depots, where they helped to replace aging ex-ST Mack C-45DT’s and C-47DT’s and veteran ex-ST GM TD-4506’s and 4507’s. Based on the type of front roll signs initially on these buses (a layout not replicated on roll signs for subsequent orders, with the route number at left in big type, and two lines of small type at right, route designation on the first line and destination on the second; and which signs, after these first MaBSTOA buses "got around" to other garages in Manhattan and the Bronx, got installed onto some buses within the 6401-6900 [contract MB-16-OA] and 8301-8780 [contract MB-17-OA] groups), they were also, at the onset, assigned to the Amsterdam and 132nd Street depots in Manhattan, to replace whatever "aging" rolling stock there was at those places (Amsterdam in particular, no doubt, would have had as dilapidated a fleet on hand as did KB and WF). 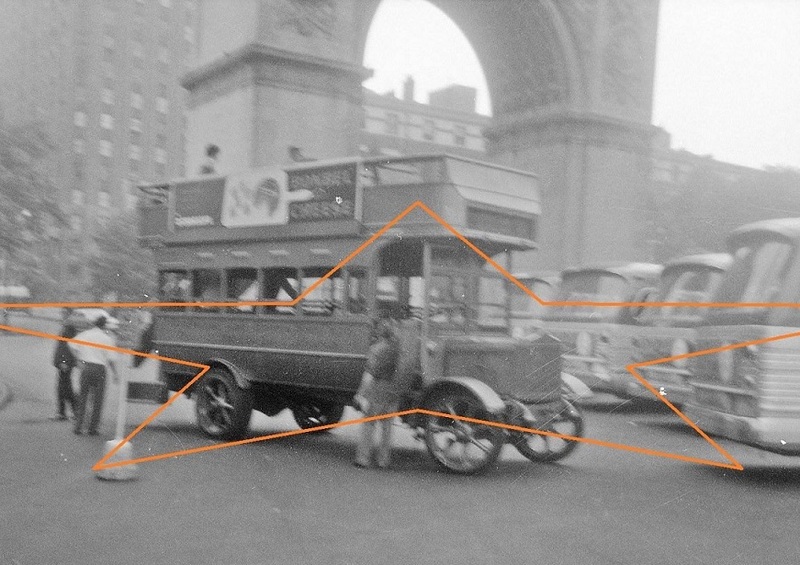 1963 photos "of the time" showed this first group of second-generation Fishbowls plying 42nd Street (no doubt on M104, as M106 by then was out of 54th Street depot) and upper Manhattan (a few M100 buses) and around Washington Square (home to the 2, 3 and 5 routes at the point buses were banned from the park effective Sept. 2, 1963). That West Farms was an initial home to those first second-generation MaBSTOA Fishbowls is evidenced by a sign for Bx42 within the Gallery, taken in 1970, on the front of 1965 bus #6541. Those types of signs were also recycled for #6830 (up to the late 1960's), 8456, 8466, 8674 and 8683 (that we know of).